When students use tool technologies to create content, their engagement is largely based on how successfully teachers craft the learning assignments, rather than on the technology itself. This is different from what happens with other types of technologies, such as tutor technologies (e.g. software for learning). Here, student engagement depends principally on technology, taking teachers almost completely out of the equation. Below, I introduce what I consider some great examples of (free) motivational tool technologies that meet the above criteria, which you can use (along with thorough instruction) to help boost student engagement. myBrainshark is a superb tool that allows students to add a voiceover to PowerPoint presentations, Word documents, videos, and photo albums -- or to simply produce podcasts. It then blends the visual and audio components together into a video presentation. In the classroom, your students can present completed projects using myBrainshark, rather than face-to-face, or they can use it for mock presentations allowing the teacher to give feedback before the real presentation. The former can help bolster the confidence and communication skills of introverted and/or passive learners. Teachers can also turn their PowerPoint presentations into narrated video presentations (e.g. explanation of concepts) that students can watch outside of school hours. The most immediate limitation of this tool is that presentations cannot be downloaded in the free version. If you are looking for a tool that also allows for video narratives along with PowerPoint presentations (instead of basic audio), I would suggest Present.me. PosterMyWall is a fantastic tool for creating artistic, high-quality posters, collages, photo calendars and/or photo cards that can either be shared online or printed out and inexpensively shipped home. Students can upload their own pictures or simply search for photos on the same site through a search function that is connected to Pixebay and Flickr, which provides access to photos licensed for educational purposes. Perhaps the best use of PosterMyWall for teaching purposes is to have students create posters as the culmination of a project to demonstrate what they have learned. Another interesting idea would be creating a poster as a means of introducing the students to a specific topic in an innovative way that stimulates discussion. PosterMyWall is slightly restricted in terms of the amount of options available for customization (mostly pictures and text), but other services, such as Glogster, offer a wider range of options. Screencast-o-matic is a powerful screen recorder that allows users to capture anything happening on their screen, as well as voice and video from the webcam for up to 15 minutes in the recorder's free version. Regarding its pedagogical use, students can record their own videos describing how they solved a particular problem step-by-step (e.g. a trigonometry problem) or explaining their thinking process about the structure of an essay. Teachers, on the other hand, can create video tutorials on virtually any subject, perhaps explaining how to use a certain piece of software for students. These can be watched at home, saving teachers valuable time that can be used for other activities in the classroom. Also, teachers can use Screencast-o-matic to provide multimedia feedback on written work (e.g. essays) both at the personal or class level. Unfortunately, Screencast-o-matic requires Java 1.5 or a later version for reproduction, which some users may need to download. However, this can be easily downloaded for free. Some high-quality alternatives to Screencast-o-matic are Jing and Ezvid, both of which are very powerful and offer unique features. 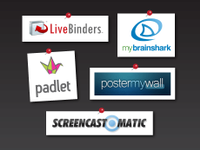 Padlet is another free program that facilitates the creation of virtual walls where students and teachers can post sticky notes with almost anything they want. These notes can include (but are not limited to) text, images, videos, or files. Posts can be arranged in a stream or scattered around the wall. Owners can moderate newly added posts through an extensive set of privacy settings. Padlet is an excellent place for collaborative work since it supports many people working together in real time. In a collaborative writing project, students could present their writing in a stream, embellished with related videos, links or images for deeper understanding. Students can also use Padlet to assemble an e-portfolio where they can organize, archive and display pieces of their work. Perhaps the most noticeable disadvantage is that visibility of walls is not set to "full private" by default. You can simply encourage students to select an appropriate level of privacy when creating personal walls. Other similar sites are Linoit or NoteApp. 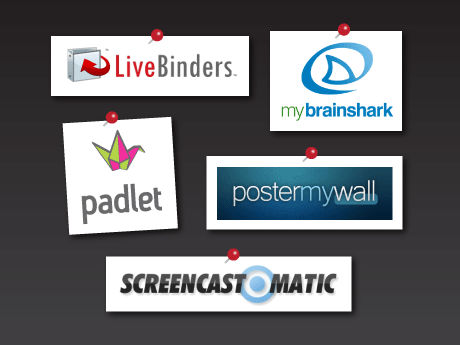 Have you used any of these tool technologies or similar ones with your students? If so, how did you engage your students with them?